The Caspar Headlands State Reserve and State Beach is located on the Pacific Coast in Mendocino County approximately 4 miles north of the town of Mendocino. The reserve is shared by a residential community in Caspar South, which lies on a bluff overlooking the ocean. The reserve is located just above Caspar Cove by driving South on Point Cabrillo Rd., past the RV Campground turning right on Caspar Drive to Headlands Drive. Parking is outside the reserve on Caspar Drive. Caspar Beach is located across from the Caspar Beach RV park and store (a private park), beginning south of the creek extending to the Caspar Headlands Reserve on the south side, a very small portion belonging to California State Parks. North of the creek is a larger portion of beach not part of the CSP system. The Caspar Headlands to the North is bordered by the town of Caspar. The north headlands includes land opposite the Caspar Inn which has trails. 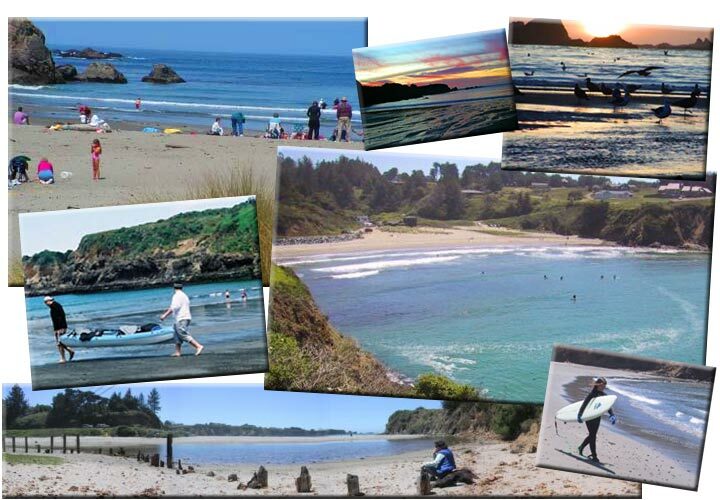 Caspar has an interesting history(below),as do most of the coastal parks in the Mendocino District. What was once a bustling lumber town in 1955, is now a village supported by farms and ranches nearby, and by urbanites visiting their summer homes, anxious to savor the rugged beauty of the Mendocino coast. The land was originally federally owned but was relinquished to and purchased by the State of California in 1912. Now it is the location of a housing development, and the state has set aside the 4 alternate tracts (mentioned above) along the headlands as a natural reserve. The lumbering era in Caspar Creek is significant. Spanning more than 90 years, from its beginning in 1864 to the closing of the mill in 1955, the Caspar Lumber Company was controlled by a single family, Jacob Green Jackson and family . It appears that the Caspar Lumber Company was able to survive where so many others failed because it was able to maintain an adequate timber supply, eventually owning the timber in what would become the Jackson State Forest. The first recorded settler and Caspars forefather was Siegfried Caspar, a man settling here from Germany to raise horses. Jacob Green Jackson was third to own the land. Already a fully functional sawmill built by the two men who sold him the land, William H. Kelley and a man simply named Randall, Jackson proceeded to boost the timber yield to 25,000 board feet per day. The town of Caspar, located on the headlands north of the mill, expanded with the mill. The first business at the town was a saloon, this was followed by a blacksmith shop, a shoe shop, and the Doyle store. A post office was established in June 1974. By 1880, an express and telegraph office, and electricity also appeared. The population of Caspar had reached about 500. Jacob Green Jackson died in 1901 and left the operation to his son-in-law, Henry Krebs. Krebs continued to expand on the company policies and the mill continued to operate until November 1955. Lumber was exhausted on Caspar Creek, the mill was shut down, and the remaining supply of logs was sold to the Union Lumber Company of Fort Bragg. Although there are no visible historical remains on the state beach, the public has ready access to the adjoining beach at the mouth of Caspar Creek, and people frequently wander about the ruins all through the harbor. Because the Caspar Lumber Company operated well into the twentieth century, there is ample evidence of the mill. However, as stated earlier, none of these remains are on present state property. The Caspar Lumber Co. was a rare entity on the redwood coast. Its life was exceptionally long. It was quick to adapt new methods, and was the first to begin steam railroad logging.